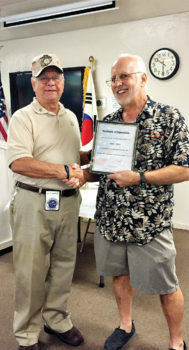 The R Countryman Chapter of the Korean War/Korea Service Veterans will meet on Tuesday, November 22 in the Friendship Room of the Sun Lakes Country Club at 10:00 a.m. KWVA is proud to welcome USAF Lt. Col. (retired) Thomas (Tom) R. Waldron. Mr. Waldron graduated from Clemson University in Civil Engineering and was commissioned a 2nd lt. in the USAF. After completing USAF pilot training, he went on to fly in the SAC (Strategic Air Command) for six years with 2,000 hours in the KC-135. He earned three air medals flying air refueling missions during the Vietnam War. A few years later, Mr. Waldron was selected to attend rotary wing training in Texas and follow on specialty training in the HH-53 helicopter. He flew several combat missions during the war and was awarded the Distinguished Flying Cross and four Air medals during this time. Mr. Waldron later volunteered for a dangerous mission in 1970 which he will speak about at our meeting. Please don’t miss Mr. Waldron’s presentation about how the HH-3 landing helicopters were able to find POWs and return safely! A special thanks to Denis White, President of the Sun Lakes Members Assistance Club (MAC), who was our guest speaker in September. MAC is a wonderful committee of neighbors helping neighbors and we will be sure to help spread the word! 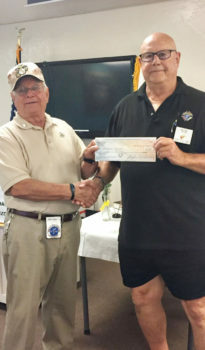 Thank you to the AZ Knights of Columbus for presenting our commander, Jay Sanderson, with a check to the Countryman Chapter on behalf of the AZ Knights of Columbus and Mr. Pete Martinez. Mr. Martinez was extremely active in both chapters and is greatly missed by all.